Ubisoft's take on melee combat is off to a great start. Medieval combat is an uncommon core focus for a video game’s multiplayer. Typically, we see combat centered on bows, arrows, and melee-based weaponry with just a pinch of magic sprinkled in. Regardless, few games have successfully managed to capture the art of mastering the sword. Ubisoft’s latest project For Honor may just change that. For Honor is set in the aftermath of a great cataclysmic event which shattered the world, leaving scarce amounts of resources scattered about the landscape which survivors then began to fight over. The three factions — Knights, Vikings, and Samurai — have been locked in an eternal conflict ever since. No matter who you end up playing as (the player must choose a side, of course) you’ll have to master the Art of Battle. The Art of Battle is Ubisoft Montreal’s take on redefining melee combat for a multiplayer generation. 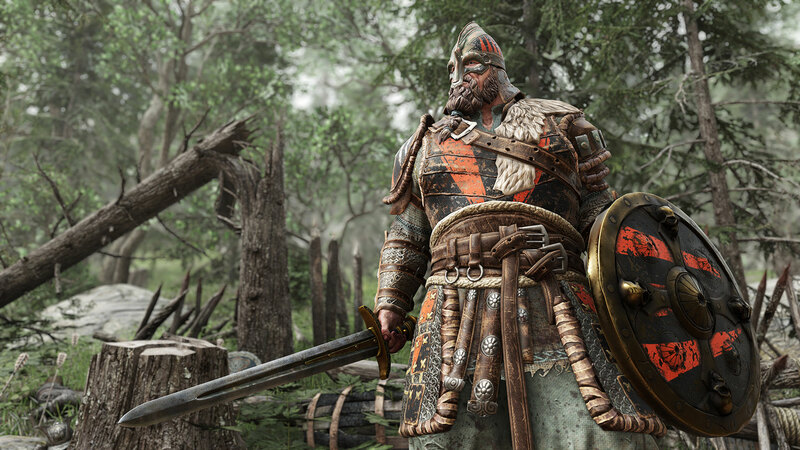 Each fight in For Honor revolves around this attack-and-block system alongside a set of combos and utilities that vary from warrior to warrior in the game. When you engage another player on the battlefield, you’ll be prompted to enter Guard Mode. This pulls up a small dial behind your character with three separate directions: Top, left, and right. By moving your thumbstick (or mouse) in a different direction, you’ll actively block attacks from that direction and be able to attack from the same. The goal? To match your opponent’s attacks to block while also attacking your opponent where they aren’t blocking. At its very core, the Art of Battle is a system that works very well in multiplayer engagements with other players thanks to the active mechanics. Each block you successfully pull off feels like an accomplishment and every attack you land has momentum behind it — especially when you pull off a successful chain or block a flurry of blows without taking a hit. That said, it does take a lot of time to get used to as which proves frustrating at first. But once you have it down, it truly engages you in a way few melee combat systems do. After you’ve got the basics of the system down you’ll have to master some of the advanced techniques too, like dodging and guard breaking. Dodging is exactly as it sounds: A way to quickly avoid enemy attacks at the expense of some stamina. These movements can also be combined with different basic attacks to use special movements, such as pommel strikes which obscure your opponent’s vision for a brief amount of time. Combination attacks are also included in the advanced half of For Honor’s combat. These attacks are specific to your character and allow you to combine a series of light, heavy, and special moves to perform a powerful or specialized move against your opponent. Much like traditional fighting games, these have to be mastered in order to truly succeed against other character archetypes combination attacks. Once you’ve got a solid grasp of the basic techniques and their more advanced counterparts, For Honor becomes a game all about mastering proper timing and utilizing your character to their full potential. Nearly every attack and combo in the game can be countered, and you’ll have to start working on figuring each of those out. Even then, you’ll have to work on attacking from different directions and trying to trick your opponent to leave themselves open by moving your guard around — which can also open you up to attack as well. It’s a high-risk, high-reward system that gets your blood pumping and hands shaking. Honestly, the Art of Battle can be extremely overwhelming at first that requires a ton of practice to really understand. I spent at least four hours learning how each of my Viking Vanguard’s moves worked in combat as well as when to use them. That said, I felt like I was actually learning and improving with each fight. There was tangible progression while fighting specific characters in duels. While larger engagements definitely need a bit of work before launch, For Honor’s off to a great start with the one-on-one fights. Not only does the system capture the (what I can only assume) tense feeling of sword fights, but it does so in a way that feels rewarding and centered on individual skill.